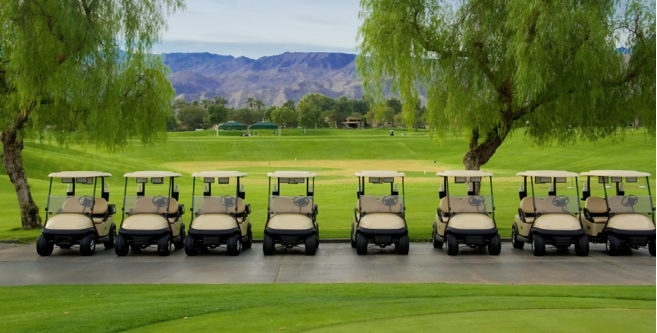 Putting together a golf tournament can be an extremely time consuming process and there are so many courses in Southern California to choose from. It is important to not only find the right course to fit your groups needs, but to also make sure the golf course you are interested in is in top condition. Simply trying to find available dates at courses, let alone negotiating competitive rates, can often require hours of your time on the phone. Whether your goal is to organize a large fundraising event or a small social group outing, a bachelor party or a couple’s weekend, a memorial gathering or a corporate event, Kennedy Golf is committed to providing an enjoyable, service-oriented experience for you and your group. Regardless of size or type, all of our clients will receive personalized attention from our tournament planning experts and, more importantly, save you hours of time. 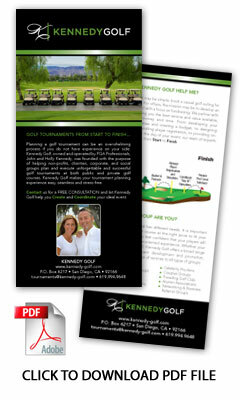 Post tournament summary, results, and company/group/sponsor recognition on Kennedy Golf website. Working with Kennedy Golf was an absolute pleasure. They are the most organized, informed, and professional team we could have dreamed up. Our event was a huge success largely in part to their efforts. This was the first golf tournament our company had attempted, and we honestly had no clue what we getting ourselves into. Holly and her team handled everything from the contracts to the timeline for our event, and made sure nothing was overlooked. We can't say enough great things about Kennedy Golf, and would recommend them to anyone looking for a smooth and profitable tournament. Thank you!!! Thank you for all you did to help make our annual Golf Classic one of our most successful ever. You quickly became an essential part of our team and we appreciate your wonderful attention to all the details that could have easily fallen through the cracks without your help. Your advice on everything from budgeting to event follow up was invaluable. Thanks to you, we are already looking forward to next year’s tournament! What a great job from Holly and John at Kennedy golf helping us achieve our fundraising goal in the 1st Annual Point Loma Kiwanis Golf Tournament. There is NO WAY this could have happened without you guys!! Thank you so much, looking forward to the next one. Thank you again for all your help planning the RWMI Golf Tournament. It was a big success and everyone had a great time. We could not have done it without you and I am excited to see what we come up with next year. I’ve attended too many tournaments to count in the past thirty years…yesterday’s was one of the best, if not the best that I’ve ever attended…everything from the check-in to the food was excellent and well orchestrated. You all did an outstanding job and made us look so very good!